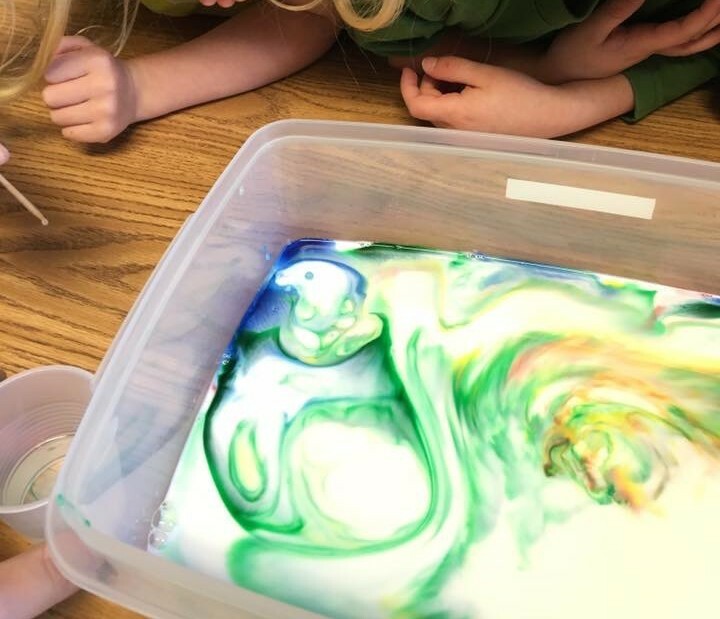 It doesn’t get much cooler than slime! 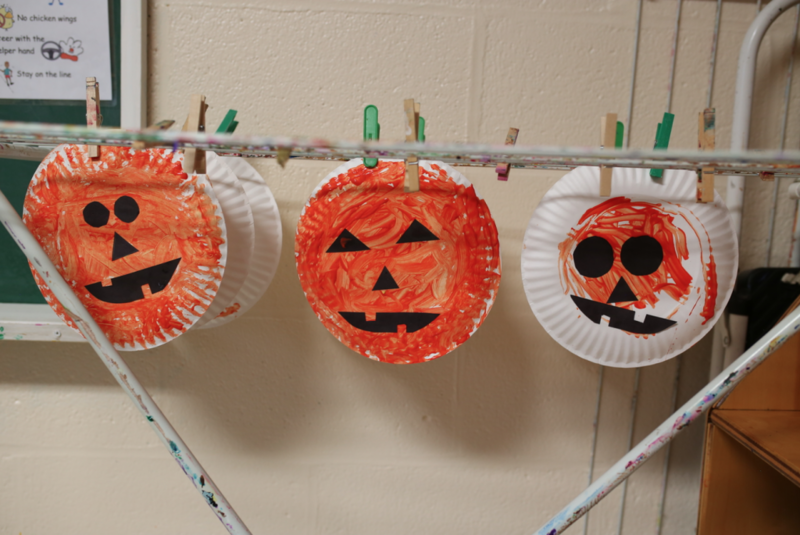 It’s ooey, it’s gooey, its sticky and slimy, it’s just plain FUN! 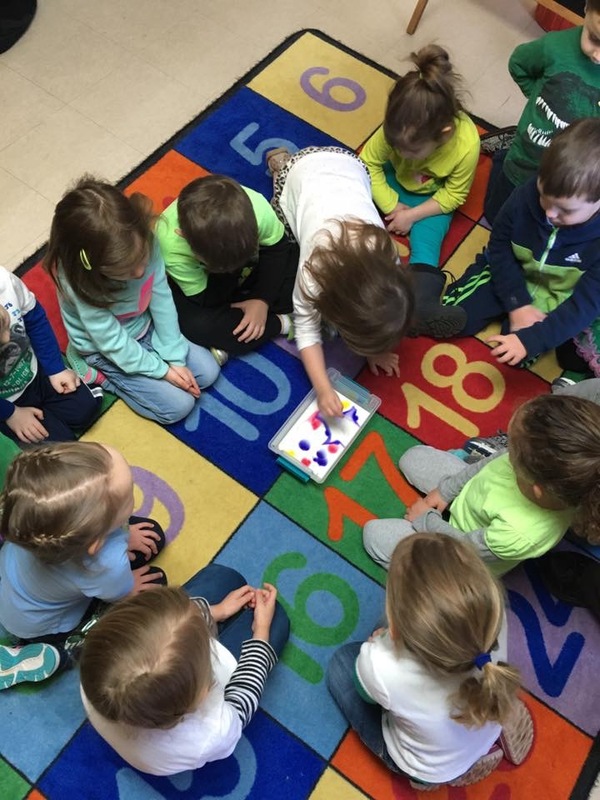 Our 3’s and 4’s classes made their very own slime and the giggles and laughs filled the school. 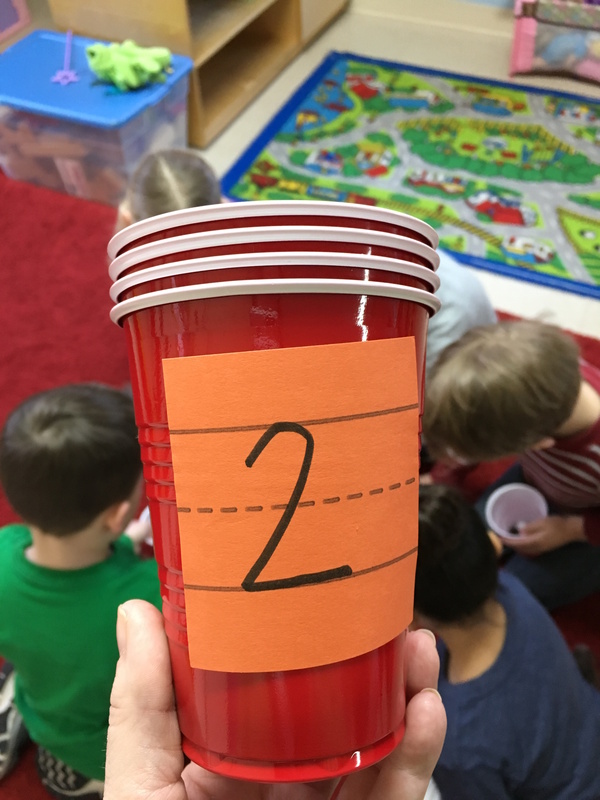 We discussed how it’s very important to follow directions when doing a science experiment, just like it’s important to follow the recipe when cooking. 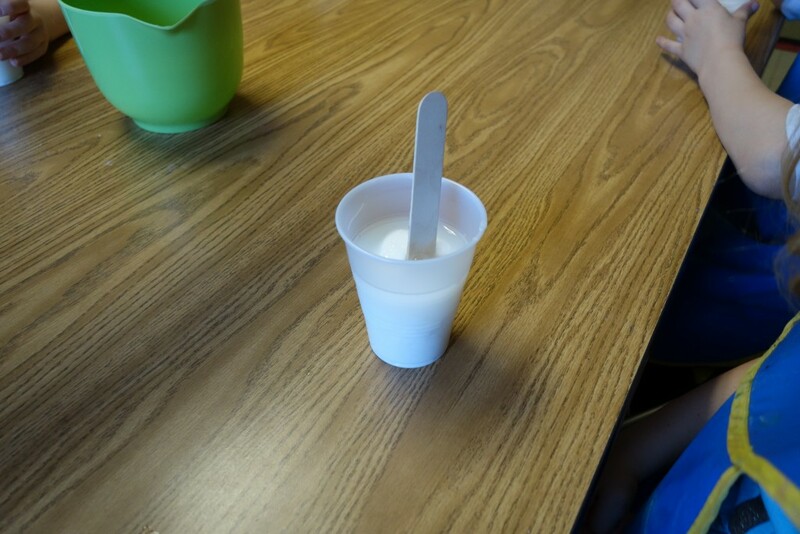 In order for an experiment to be successful we need to be careful with our measurements and follow the instructions very carefully so that we add the correct amount of each ingredient. 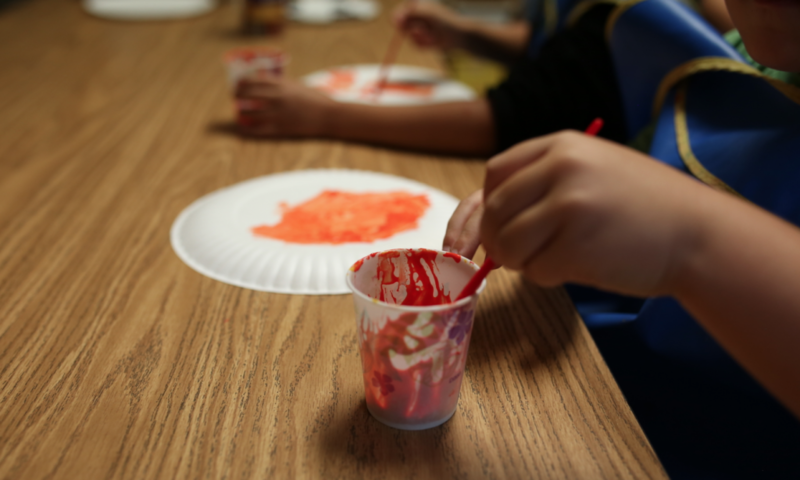 It was messy and fun adding each ingredient and working them together to make something completely new. 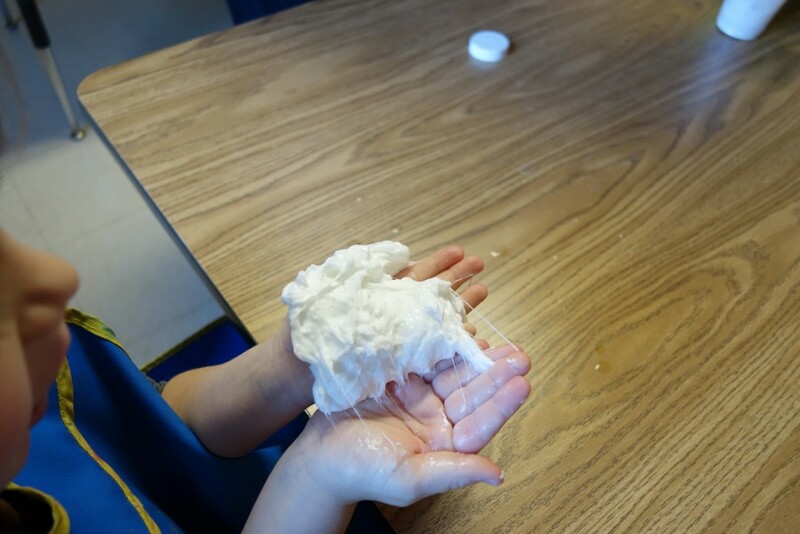 The kids learned that by manipulating the sticky wet glue mixture with their hands, they could create the perfect slime. The kids loved stretching their slime or squishing it and best of all they loved how it bounced when they made it into a ball. Mother Nature seems to be confused about what season we are in but we are all very ready for Spring! 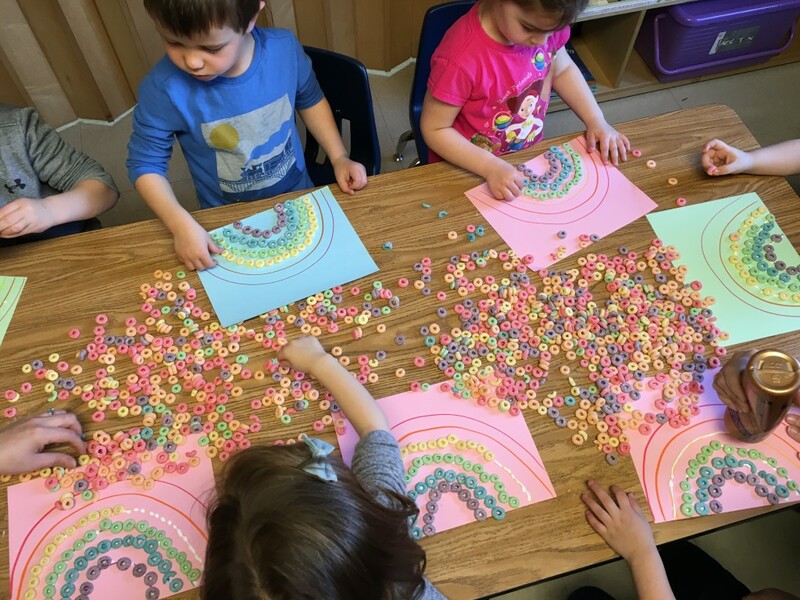 We have been having fun getting ready for Spring and enjoying the fun March has to offer. 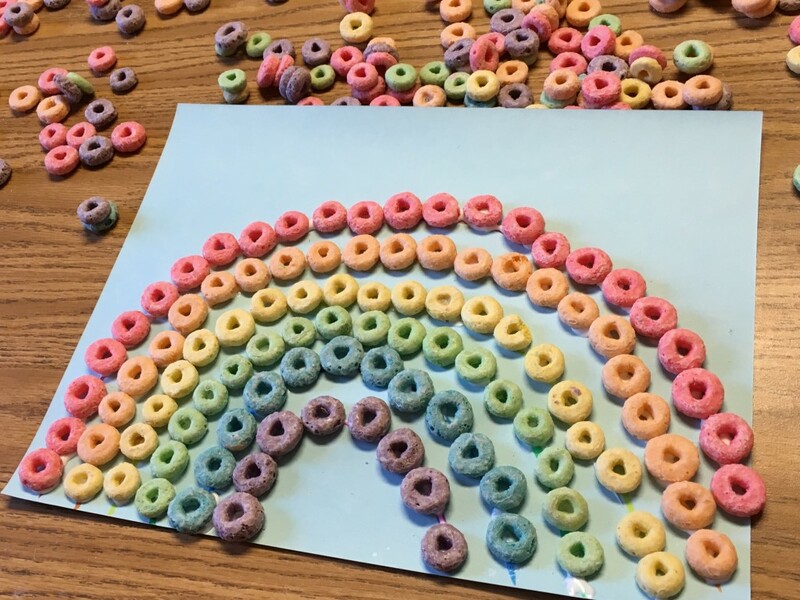 We created our very own rainbows with fruit loops. 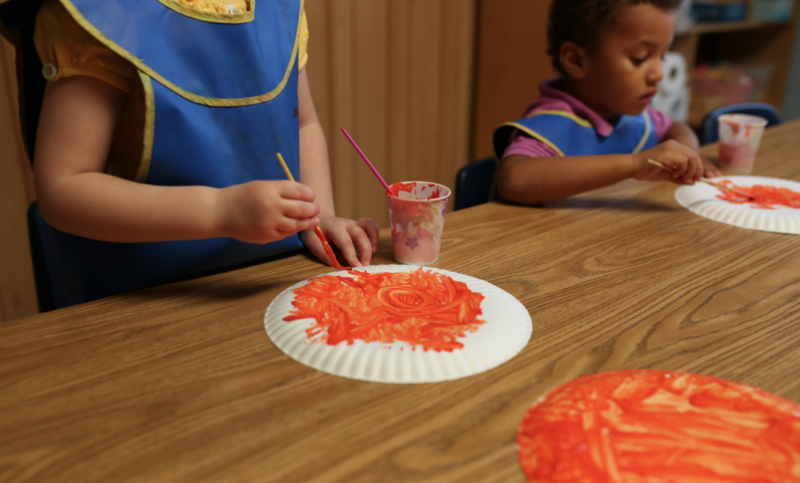 The kids had so much fun with this messy and colorful activity. 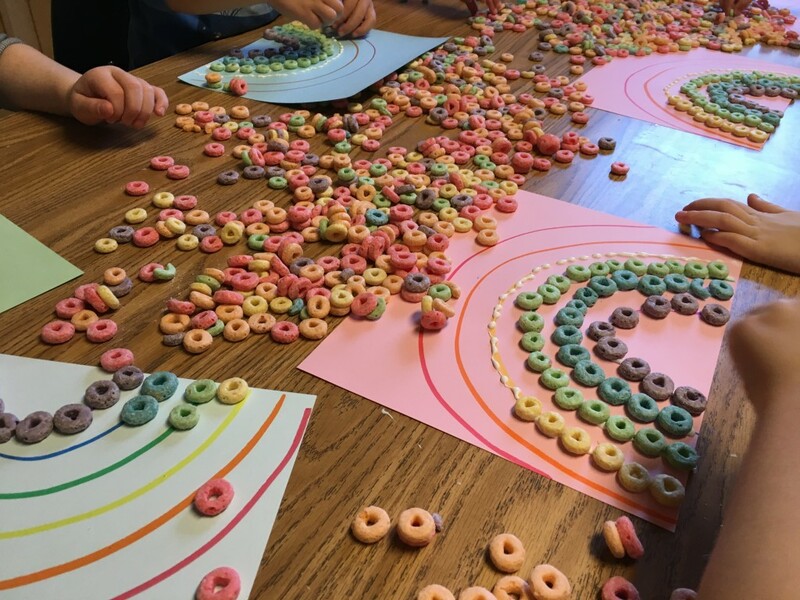 The kids sorted the fruit loops into the colors they needed and created beautiful rainbows the classroom smelt absolutely delicious for 2 days after this project and it was definitely worth it! 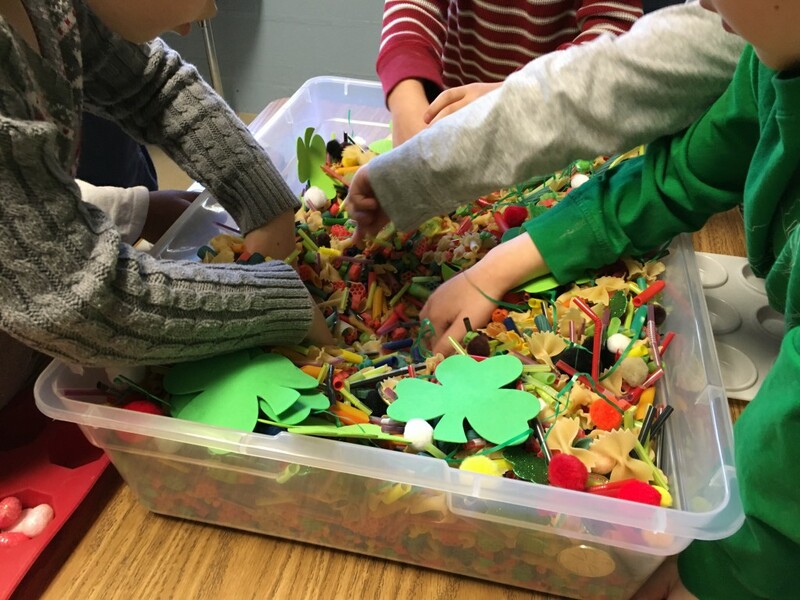 The 4’s classes explored the March sensory box searching for hidden coins and other fun treasures. 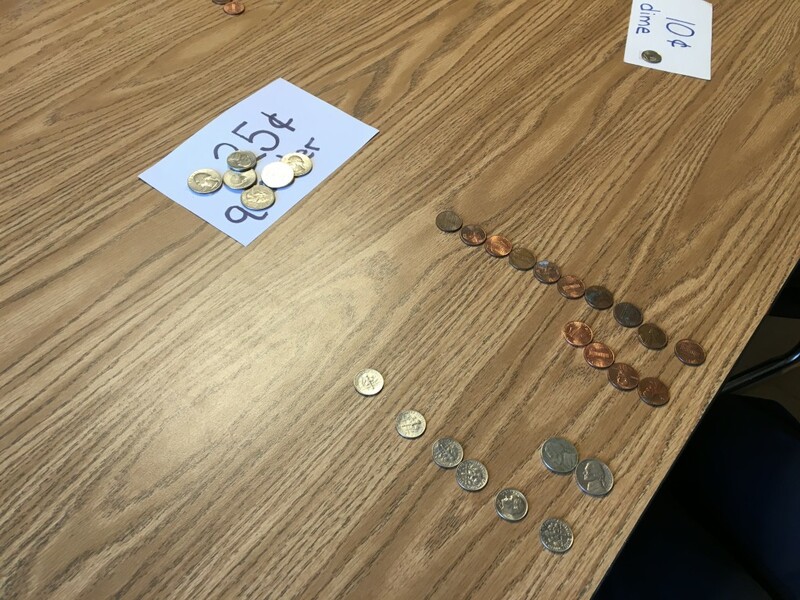 Once they found the hidden coins they used their new money math skills to determine who had the most money based on the coins they found. 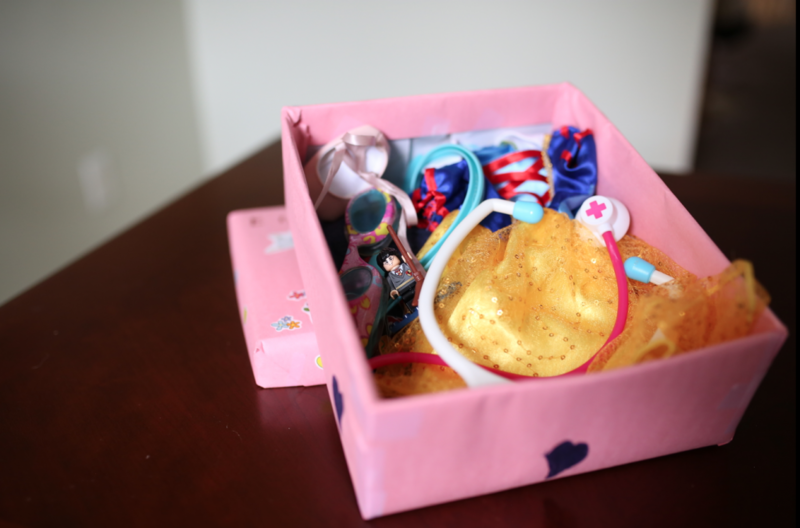 The sensory box is a fun and exciting way to end a busy day at school. Who doesn’t love an Ice Cream Sundae Party?! 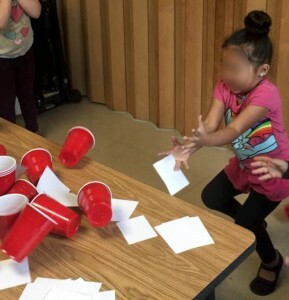 The kids are working hard to pay for their very own ice cream party here at school. 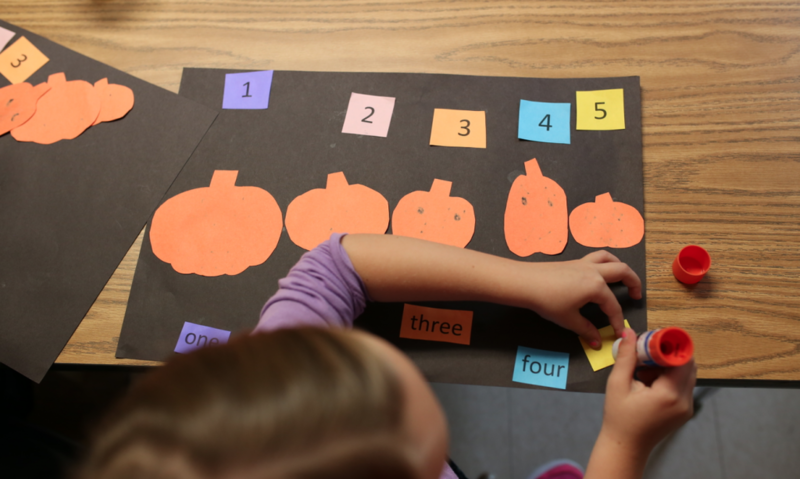 Here at CNS we believe that learning continues at home and that teachers and parents work together to help our children learn and grow the best. 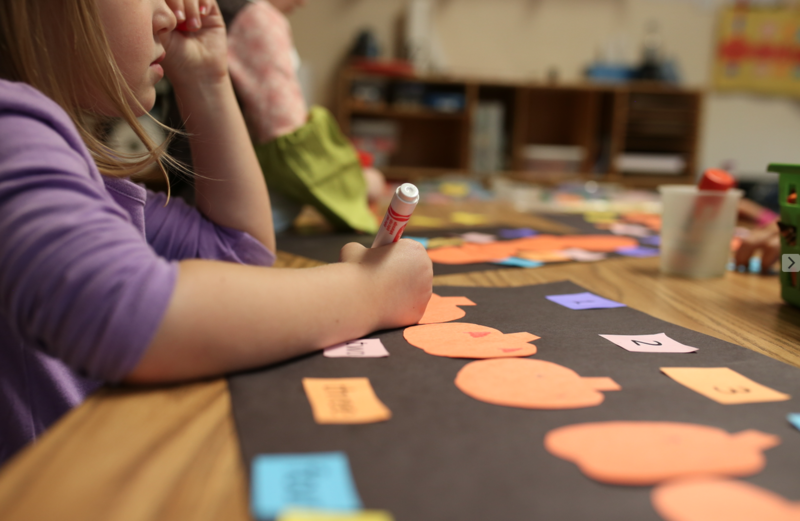 Sometimes the lessons start at school and continue at home. This is the case with our money unit. 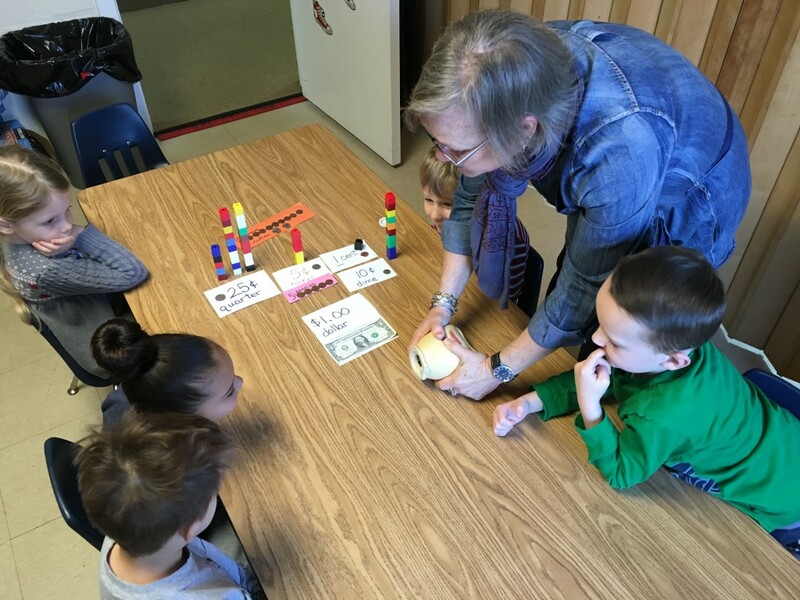 We learned the value of the different types of money and what we need money for and how we earn money through doing jobs. This is where the lessons continue at home. Our 4’s classes are working very hard to earn their own money at home by doing jobs to help their parents. 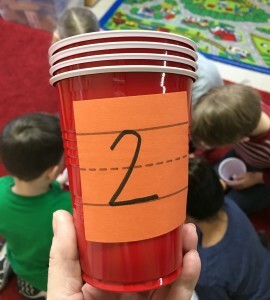 Some kids are just starting to do jobs to earn money and others are adding extra jobs around the house to earn money to add to our “Save Jar” at school. The jobs the children complete at home and the monetary value for those jobs are at the discretion of the parents. The kids are learning the importance of working to earn something, in this case money, and they are learning responsibility for themselves. 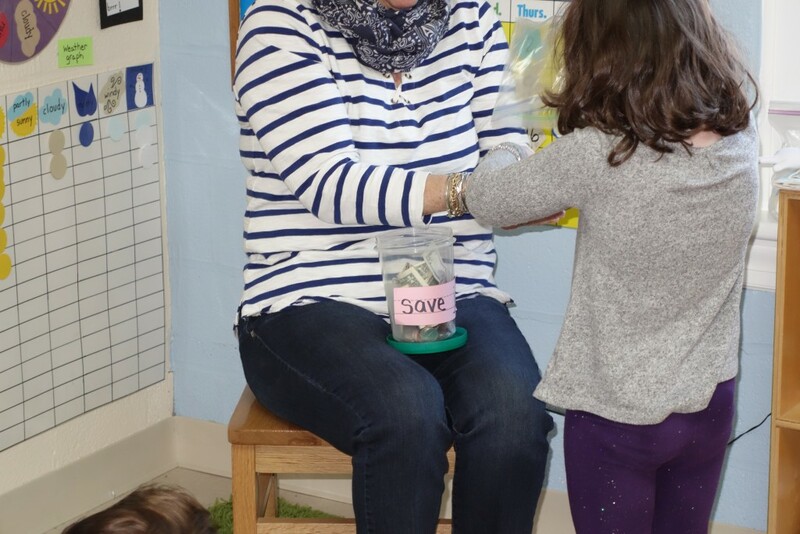 Every week the kids take turns telling the class the jobs they did to earn money and then they add it to the “Save Jar”. It’s amazing to see how much these kids are helping at home. 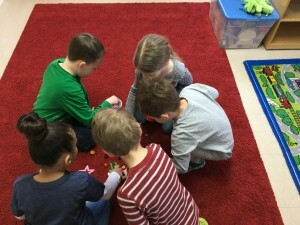 Not only are they learning the value of a money but they are learning it takes hard work to get enough money to buy the things we need and want. 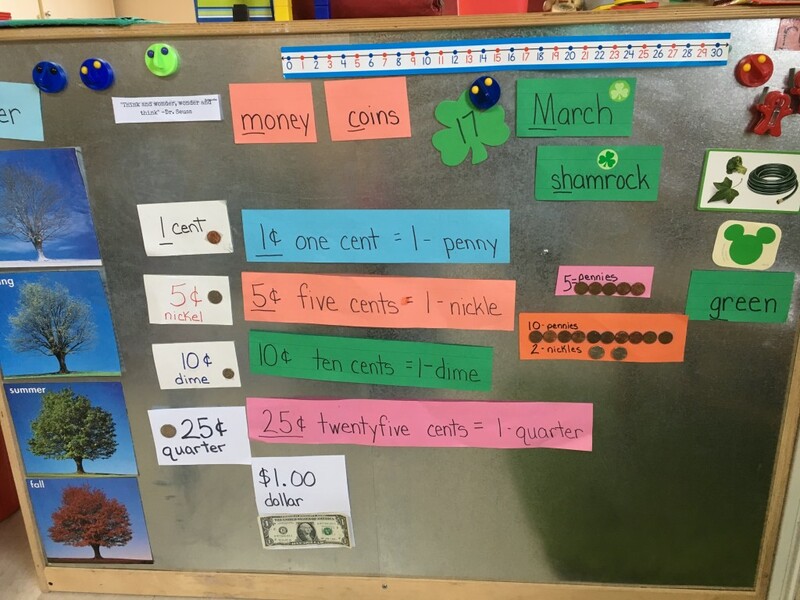 We are continuing to build on our math skills through this project and learning to count up our coins and bills in a variety of ways. We can’t wait to see how much we have saved by our Ice Cream Sundae Party in April! 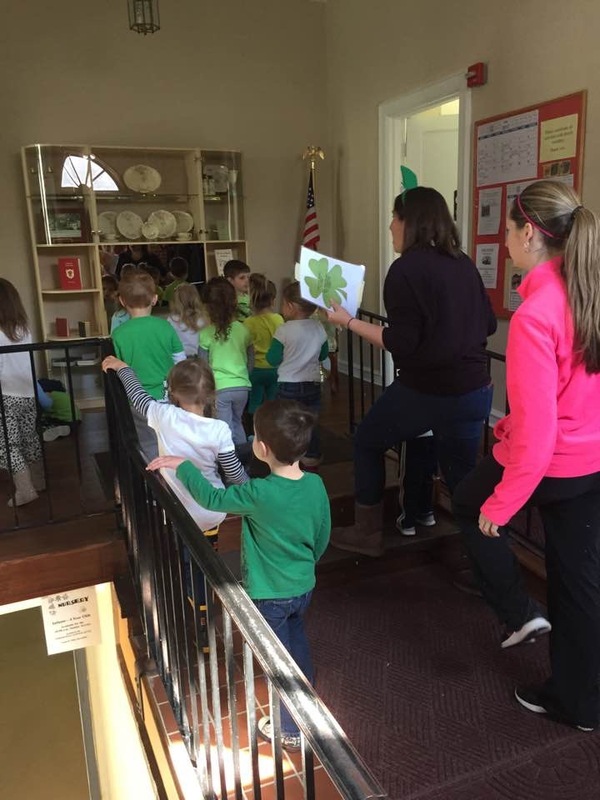 St. Patrick’s Day is by far one of the most fun days we have here at CNS! 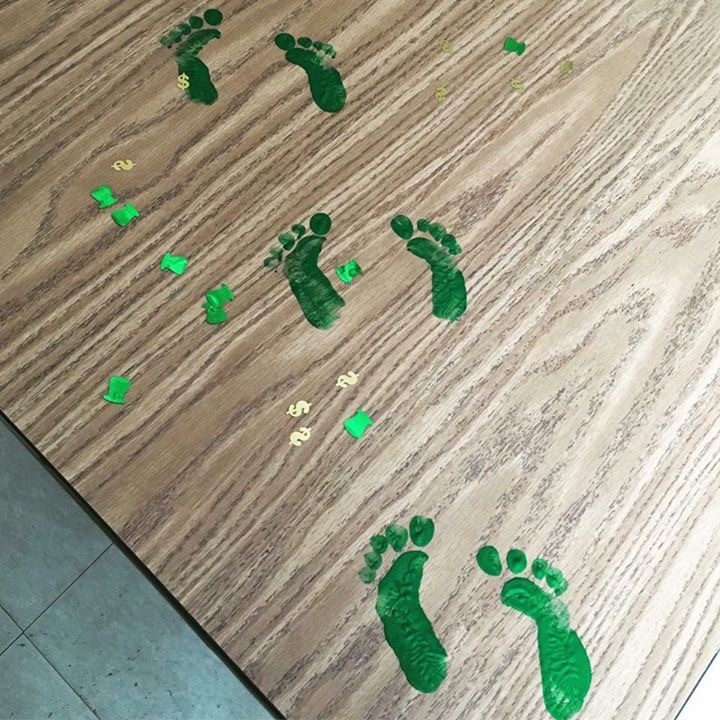 When the kids arrived at school they found green leprechaun foot prints all over the art room and even in the bathroom. 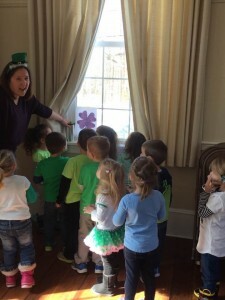 This led to a special scavenger hunt to find what else the troublesome leprechauns may have left for them at school. 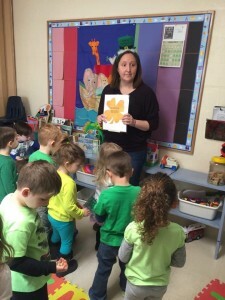 Our classes followed the clues and searched for gold coins on a very magical hunt for answers. 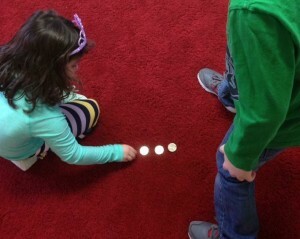 We practiced our counting skills by counting our gold coins when we returned to the classroom. 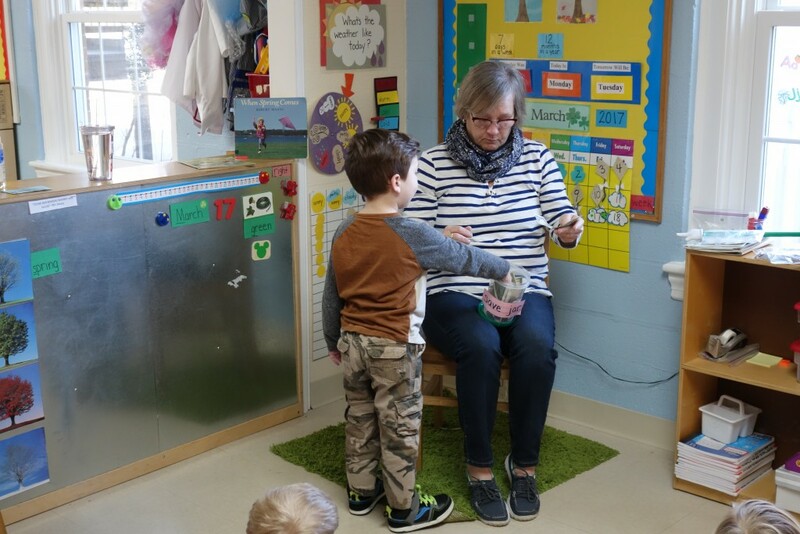 We also had a very special rainbow science experiment and finished the day with dancing to Irish music with their friends. Our 4’s classes have started to learn about money and why it’s a necessary part of our lives. 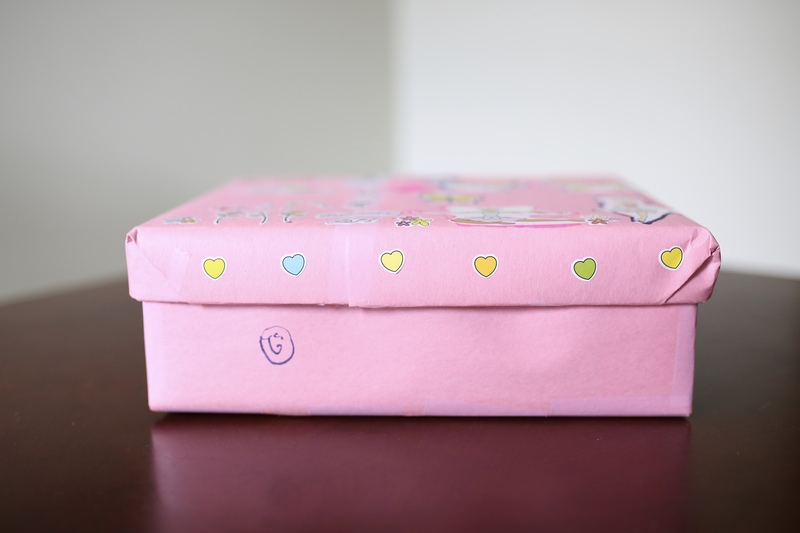 We talked about what we use money for, such as buying food or paying for clothes and toys. We also discussed how we get money through doing jobs and working. 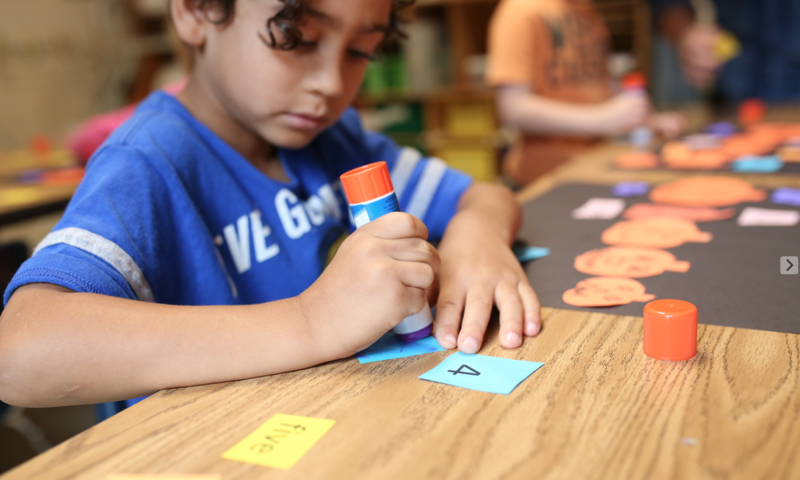 We learned that there are different types of money, coins and bills, and what the value of each one is. 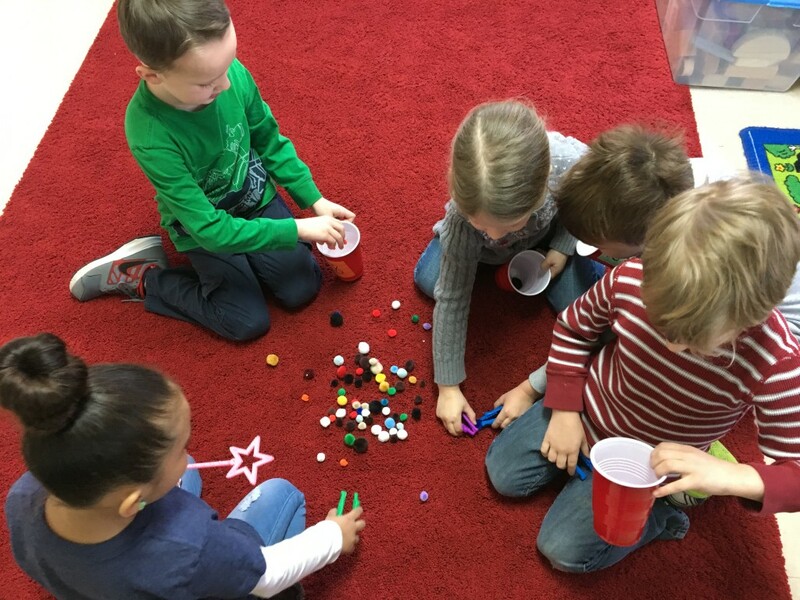 In small groups we sorted our money into piles based on their value and decided which one had the most money. Sometimes you need to see something to really understand it. When you see 100 pennies next to a dollar bill, it helps to reinforce that a penny is worth 1 cent. 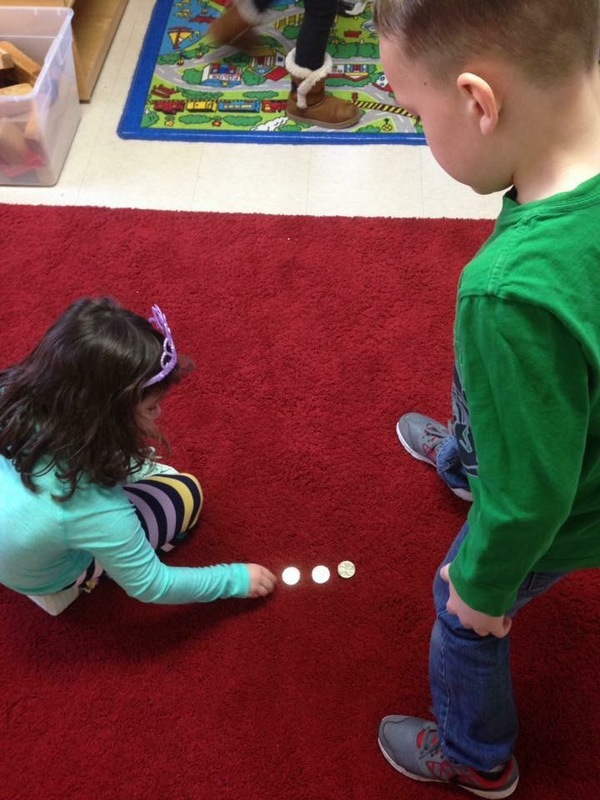 We practiced counting by 5’s when counting the nickels and counting by 10’s when we were counting out dimes. We learned that 100 pennies is the same as a dollar but that a dollar is much easier to carry around because it weighs a lot less than 100 pennies. Can you imagine paying for groceries with pennies? No way! And that sometimes we use a debit card to pay with cash from our bank account without actually carrying our money with us. 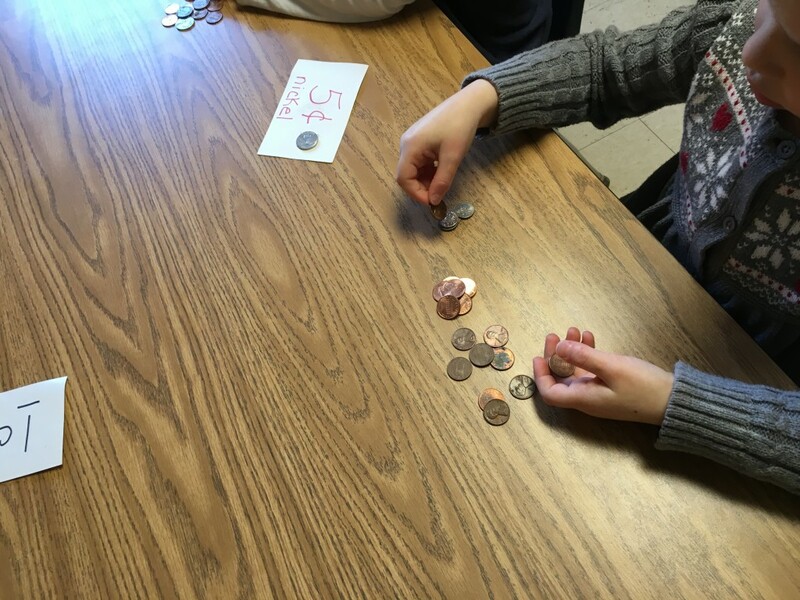 We also learned that a quarter is worth 25 cents or 1/4 of a dollar. When you have 1/4 of something it is called a quarter of whatever you are measuring, which is how this coin got it’s name. Money is essential to our lives and although it might seem like a lot for 4 and 5 year olds to comprehend, they picked it up very easily and we’re eager to learn more. Over the next few weeks we will be working with money to help better understand it and reinforce what we have learned. 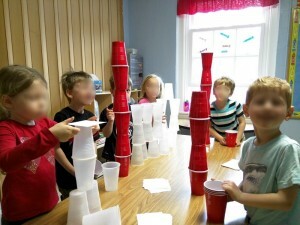 The kids got to participate in some STEM-inspired building activities this week. We learned about balance and stability using different sizes of cups and pieces of paper. 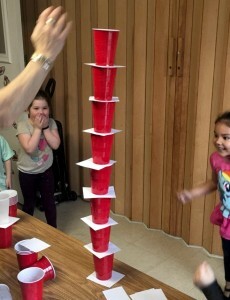 First the kids built up the towers as high as they could. 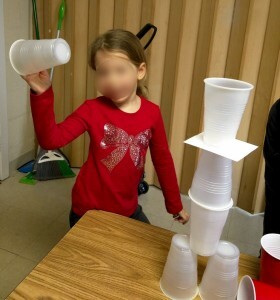 They were very innovative at coming up with different strategies and building solutions! 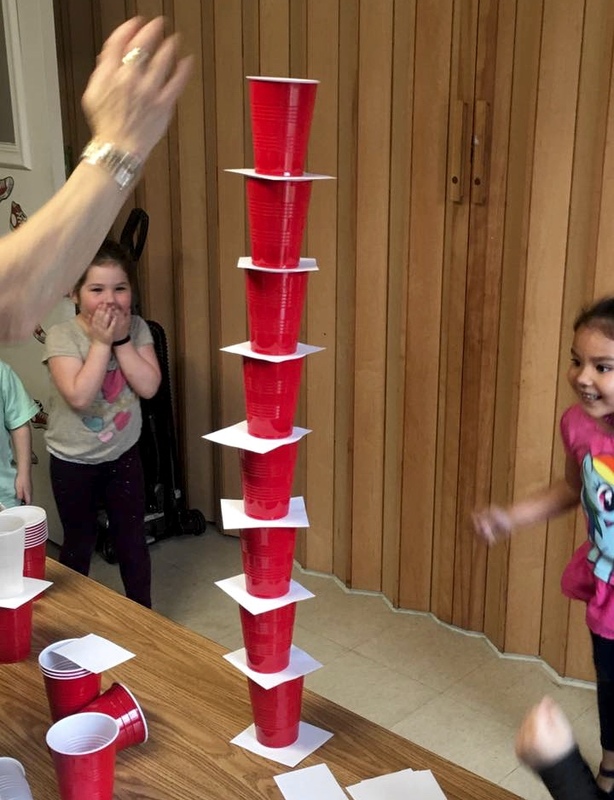 Later we incorporated little sheets of paper to see how that changed the building process. And then the best part – knocking it all down!